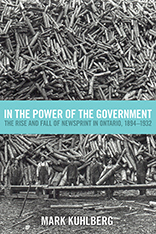 The Canadian Business History Association - l'association canadienne pour l'histoire des affaires (CBHA/ACHA) is pleased to announce that jury members unanimously endorsed Mark Kuhlberg’s In the Power of the Government: The Rise and Fall of Newsprint in Ontario, 1894-1932 as the winning entry in the Canadian Business History Association’s best book in Canadian business history competition. In presenting the award at the 2017 CBHA/ACHA Conference on 150 Years of Canadian Business History, CBHA/ACHA Chair Dimitry Anastakis remarked that at its core, Kuhlberg’s book offers a re-interpretation of H.V. Nelles’s long-standing account of the links between the Ontario government and the business community in the development of the province’s natural resources. Utilizing an impressive array of archival sources, Kuhlberg convincingly contends that successive provincial governments were primarily interested in developing agriculture in Northern Ontario by allowing settlers to sell timber cleared on their farms without constraint and did not regulate the pulp and paper sector exclusively through export restrictions on pulpwood cut by corporations on Crown land. In the Power of the Government will appeal to business historians and public policy scholars, and it will play an important role in re-invigorating the academic study of Ontario’s economic development in the twentieth century. The CBHA/ACHA Best Book in Canadian Business History includes a cash prize of $2,000. The prize committee encourages the submission of books from all methodological perspectives. It is particularly interested in innovative studies that have the potential to expand the boundaries of the discipline. Scholars, publishers, and other interested parties may submit nominations. Eligible books can have either a Canadian or an international focus, which includes a Canadian perspective.